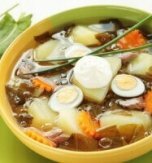 This is a light version of a traditional Ukrainian beet soup that is very hearty and usually cooked with meat and served with salo. 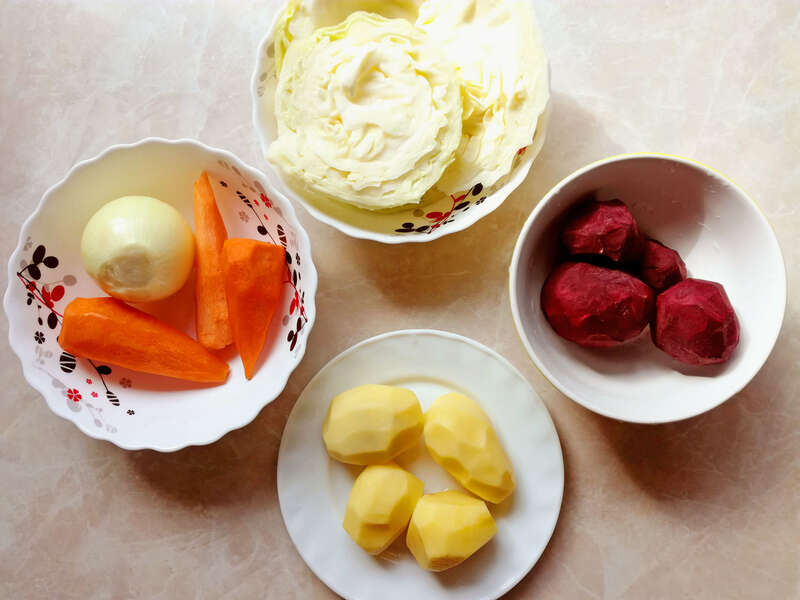 Most recipes have a beetroot as the main ingredient which gives borsch a rich dark-red color and this recipe also includes this vegetable. For more intense color, we’ll add tomato paste. Once you taste a bowl of this vegetarian beet soup, it’ll become one of your favorites. 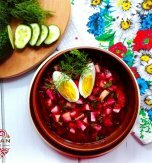 Packed with lots of veggies, served together with sour cream and black bread, this borsch is a wonderful idea for a lunch or dinner. It will keep all your family filled for hours. 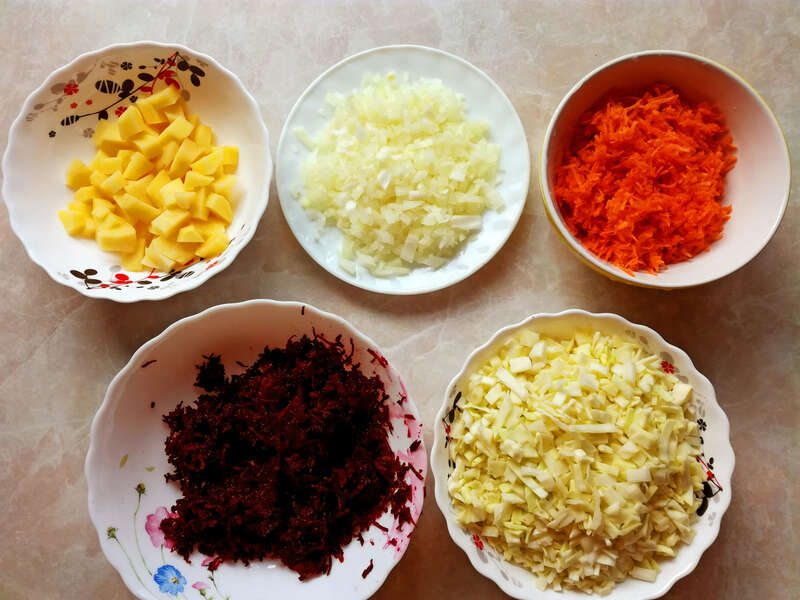 To cook this meatless borsch we need to prepare one ingredient beforehand. Rinse kidney beans under running water, transfer them to a bowl and pour water above. Set aside for a couple of hours (this will help soften the kidney beans and prevent them from bursting while cooking). If you have more time, it’ll be great to leave the kidney beans in water for a night. Pour off water and flush kidney beans one more time. Put them in a pan, pour water above (1,5 liter), and cover the pan with a lid. 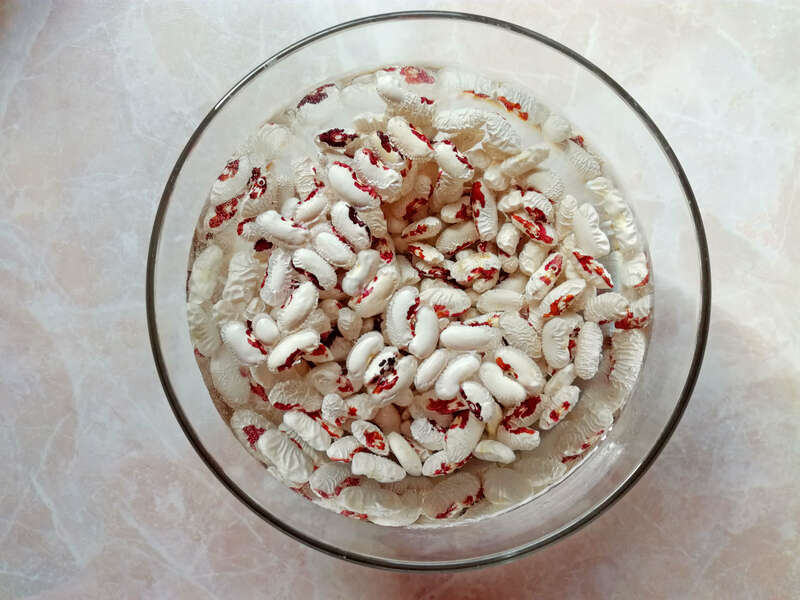 Boil the kidney beans for 30 minutes. Then pour off water, fill the pan with fresh water. Put the cooked beans there. Chop beetroots, onion, and potatoes. 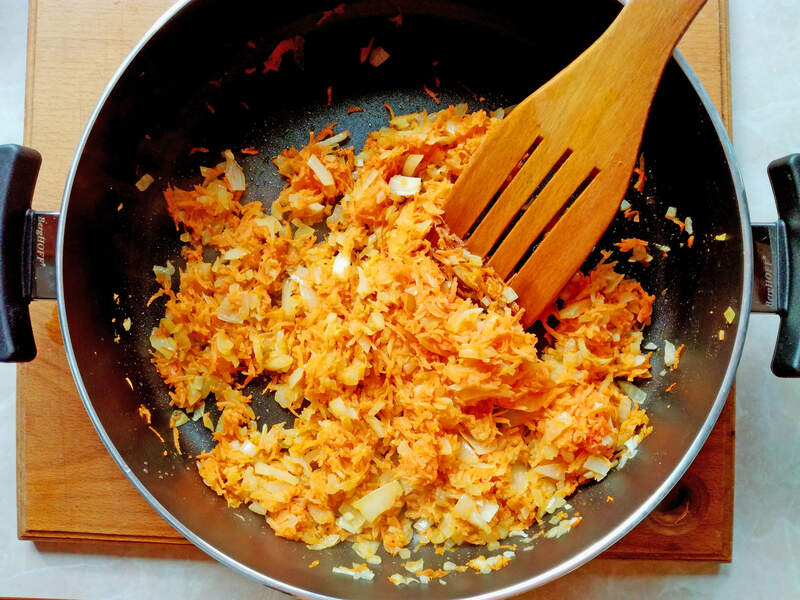 Grate carrots and shred cabbage finely. Preheat sunflower oil in a skillet, add the onion and fry it over medium heat until translucent. Add the carrot, stir to combine, and cook the ingredients for 10 minutes until golden. Transfer the prepared mass to a plate. You can use the same skillet to cook the beetroot. Just add sunflower oil and beetroot. Fry it for a quarter of an hour. 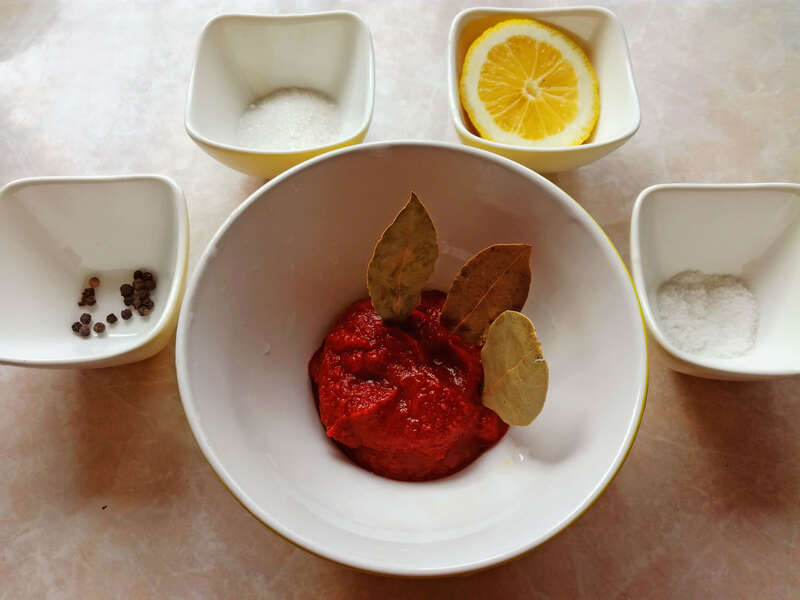 Then mix the beetroot with tomato paste, sugar, and lemon juice (aiming for a pleasing but subtle sour taste and preserving the ruby color of the beetroot). Cover the skillet with a lid and stew the beet until soft. To prevent the beetroot from burning, you can add some water or beans’ broth. Mine was cooked in about 20 minutes, but all depends on how large you cut the beet and how soft you want it to be. When the beans are done, add the cabbage and potato to the pan. Adjust salt to your taste. Bring the mass to boil and cook it for 20 minutes. Then add the carrot mixture. Bring the soup to boil again and cook it for 15 minutes more. When the cabbage is cooked, add the beetroot mass. Stir all ingredients carefully and bring borsch to boil. Cook it for 5 minutes. With a few minutes left, add bay leaves and ground black peppercorns. 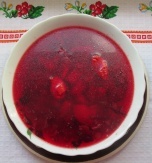 Taste your beetroot soup and adjust salt/sugar to your preferences to reach the most pleasant taste (Ukrainian beet borscht should have a balanced sweet-sour taste). Remove the soup off the heat, cover it with a lid. Set aside the borsch and let it sit for 20-30 minutes. Garnish the beet soup with a dollop of sour cream and top it with chopped parsley and dill for freshness. 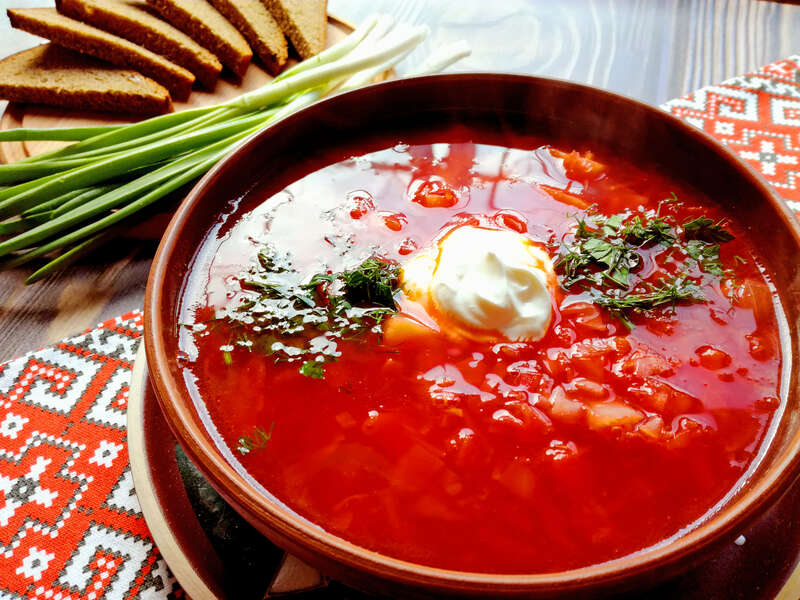 Serve our vegetarian borsch with thin slices of black bread and crunchy spring onion. 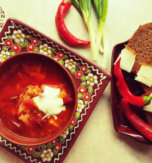 Have you liked the recipe for vegetarian borscht?